Karen A. Ernisse, 64, of N Garfield Avenue in Port Washington died Thursday, January 15, 2009 at Columbia St. Mary’s Hospital in Mequon. She was born June 29, 1944 in Port Washington to William and Mary Caporali Peterson. She grew up in Port Washington and graduated from Port Washington High School. She lived on Dries Street in Saukville while she raised her family. Karen worked for Leeson in Grafton for many years until they downsized. For the last 5 years she worked at Badger Meter in Brown Deer. She was an outgoing person and always had a smile to share. She walked 5 to 6 miles a day and liked to stay active. Karen loved animals, having pets and caring for the wildlife around her and supported the Ozaukee Humane Society. Most recently she adopted Amy, a rescued dog from Hurricane Katrina. 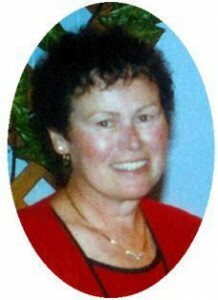 She loved her family very much and was a dedicated caregiver. She enjoyed spending time and playing with her grandchildren. She is survived by her children Christine (Mike) Wondra of Lomira, Wisconsin, Tony Ernisse (Lynne Alva) and Bill Ernisse both of Port Washington. She was a proud grandma to Andrew, Dustin, Mackenzie and Hunter, loving daughter of Mary Peterson of Port Washington and dear sister of Georgine Molitor of Port Washington. Further survived by her ex-husband Leroy (Mary) Ernisse, other relatives and friends. Preceded in death by her father William, infant children Laurie Ann and Thomas and brother-in-law DuWayne “Wiener” Molitor. Rev. Tom Lijewski will celebrate Mass of Christian Burial 6 pm Tuesday, January 20, 2009 at St. Mary’s Church, 430 N Johnson Street, Port Washington. Entombment St. Mary’s Cemetery. Visitation 4 – 6 pm Tuesday AT CHURCH. Memorials to the Ozaukee Humane Society appreciated.